Pain! What is it good for – absolutely nothing! That is a take from the song back in 70’s - War! What is it good for – absolutely nothing! The irony is, chronic pain is a battle that hundreds of millions of people face today. To be accurate, pain has a lot of worth. Pain is our body’s natural alarm system or mechanism that says something is wrong, damaged or broken and needs repair. When we twist an ankle or break an arm, the condition sends to our brain a very intense signal – pain! It can cause one to wince, bite their lip and even shed some tears. This type of pain is referred to as acute pain. Acute pain can be a forerunner to chronic pain in many instances. Acute pain needs to be tended to immediately. The first line of defense is to reduce inflammation. Once the inflammation is reduced, the pain signal to the brain starts to lessen and in a very short period, no pain is felt. But, what about pain that lingers for more than a few weeks, or even a few months? This is referred to as chronic pain. Chronic pain can make someone a prisoner of the war they’ve been in battle with for years. Unlike acute pain, chronic pain can become a consistent part of one’s entire life. Because I have personally struggled with chronic pain for most of my life, I know firsthand what it feels like to break free from pain. When I try to explain what chronic pain feels like to others who have no pain, it’s hard for them to relate. So, I often use the analogy of someone pinching your skin with their fingers or worse using a pair of vice grip pliers and never easing up. Chronic pain is constant, unrelenting and debilitating. So how can one expect to thrive when suffering with chronic pain? To thrive in life while dealing with chronic pain, the individual must first address their mental attitude or focus. In other words, if you or someone you know struggles with the battle of chronic pain daily, the only thing on the mind is pain. They always talk about it because they always think about it. I remember those painful years and how my wife would be there for me every inch of the way. But even as loving and caring as she was and still is, she would have to remind me to stop talking about my pain all the time. The truth of the matter was, she was right, and I needed to change my mental attitude or thought process. There were many times when I was asked to speak at certain events. Well my first reaction would be, “I can’t do that because I’m in too much pain.” So, I would decline the invitation which came from a defeated mindset. Anytime I was asked to speak at a certain event, my first thought would be, “I can’t do that because I’m in too much pain.” I knew I would have to make some mental changes or end my career, and become a fixture in my living room. By shifting the mind on other mental images or distractions, i.e. speaking at an event or TV show, I soon realized I was not conscious of the very pain that was always crippling me. By refocusing my mind or thoughts to another image, etc. I reduced and even temporarily eliminated the pain signal to my brain. But what does someone do on a day to day basis to be able to thrive while in pain? I understand not everyone takes part in regular events that can act as a distraction, but one can still create mental images on a day to day basis. The process is simple and takes practice but as you are mastering these mental images you will reduce your pain. In fact, just the developmental process alone will bring pain relief. This technique can be done anywhere at any time. Simply inhale from the diaphragm, not your chest. When done correctly you will see your belly bloating outward. You inhale through your nose, hold it for one second and then slowly exhale through tightly held lips. Then repeat. In a nutshell - belly breathing or diaphragmatic breathing releases a calming neurotransmitter from the brain that stimulates your Parasympathic Nervous System. This part of your autonomic nervous system releases a calming effect on your heart, blood pressure, arteries and adrenal glands while lowering your Cortisol levels. This process allows for proper healing. When done daily, this simple technique allows one to take control of their pain level and take back control of their life. Refocusing the brain, using mental imagery and practicing diaphragmatic breathing are just a few of the many techniques used for managing chronic pain to thrive while moving closer to pain-free living. 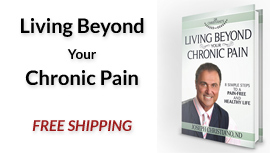 Check out my book, Living Beyond Your Chronic Pain for more ideas!